"This seminal work . . . establishes a persuasive new paradigm. ""Contemporary Sociology"
No book since "Schooling in Capitalist America" has taken on the systemic forces hard at work undermining our education system. 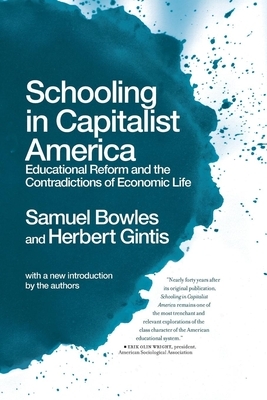 This classic reprint is an invaluable resource for radical educators. Samuel Bowles is research professor and director of the behavioral sciences program at the Santa Fe Institute, and professor emeritus of economics at the University of Massachusetts. Herbert Gintis is an external professor at the Santa Fe Institute and emeritus professor of economics at the University of Massachusetts. Samuel Bowles: Samuel Bowles is Research Professor and Director of the Behavioral Sciences Program at the Santa Fe Institute, and Professor Emeritus of Economics, University of Massachusetts. Herbert Gintis: Herbert Gintis is an external professor at the Santa Fe Institute and a Emeritus Professor of Economics at the University of Massachusetts.